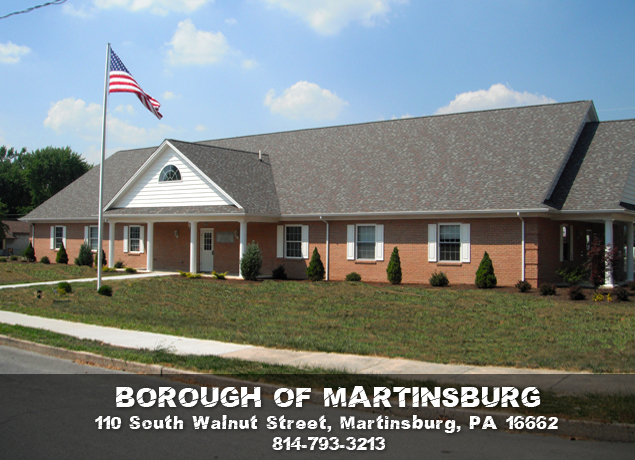 The regular meeting of the Martinsburg Borough Council was held on Tuesday, September 6, 2011, in the new municipal building located at110 S. Walnut St. The meeting started at 7:00 p.m. with prayer by Randy Stoltz and the Pledge of Allegiance. Andrew Katz of the Blair County Chamber of Commerce was planning to attend the meeting this evening to speak on municipal cooperation but had some personal business he had to tend to. The MINUTES of the regular meeting of August 1, 2011, were approved with two minor corrections to the police report on page 1, on a motion by Suzanne McNally, seconded by Linda Smith. The motion passed unanimously. The FINANCIAL AND TREASURER’S REPORTS were presented for August 2011 as written. The LIST OF BILLS for August 2011, check nos. 6106-6166 in the amount of $150,682.66, was approved on a motion by Doreen Easly, seconded by Suzanne McNally. The motion passed unanimously. Chief Kerry Hoover presented the police report as written. On August 23 the East Coast experienced an earthquake at approximately 1:53 p.m. At 3:15 p.m. the Blair County 911 Center had a conference call with all the police chiefs in the county to assess any damages. The 911 Center received almost 200 calls within 10 minutes, but no major damages were noted. The emergency operations center was set up and ready to handle the emergency. The monthly chiefs’ meeting was held on August 24 – new radios was the topic of discussion. It will cost between $13,000-$18,000 to replace the radios we currently have. The county is still trying to get a bulk pricing. August was a busy month – the fact that the kids are back to school did not affect the activity since most of it was adult issues as well as animal issues – there have been a lot of loose dog incidents lately. Manager Stoltz responded to Doreen Easly’s inquiry about the pedestrian crossing caution signs. They have been moved to the side of the streets due to the recent bus and farm equipment activity since they are larger and wider vehicles than the summer traffic. The signs may be taken completely down during the winter to plow snow. Manager Stoltz reported that PennDOT was in on August 5 to approve our paving project and the project completion forms were sent in; the East Coast experienced an earthquake on August 23 – was contacted by the Blair County Emergency Management – Martinsburg had no damages to report; we are projected to receive over nine inches of rain between September 6-9 from one of the storms coming up the coast from the south – Martinsburg Municipal Authority received over $10,000 from Federal Emergency Management Agency from the flood damages in 2004 to fix the road that leads up to our water tank. Manager Randy Stoltz gave a presentation at Homewood Retirement Home on August 8 to discuss how the nitrate removal system plant works. Wineland Well nitrate levels were 10.9 mg/l last month and up to 11.2 today. The pretreated water going into the nitrate removal plant was 11.2 mg/l and came out of the water plant at 1.0 mg/l after treatment. Rich Brantner has the system practically all figured out already. An automated dial system has been set up for emergencies. Jane Stailyprepared a preliminary 2012 budget worksheet for in the packets this month. A budget meeting will be planned after the September financial reports are prepared. Attorney Frederick Gieg, Jr. reported that the closing on the sale of the old municipal building went well. There were no realtors’ commissions to pay. Attorney Gieg felt that council made a wise decision on the sale of the building. The new property owner will maintain it well. Attorney Shawn Sullivan’s partnership has actually borrowed extra money to put into the building. The sales agreement includes an understanding that the food bank will continue to remain there [for three years] at no cost to the food bank. In the event that someone should get injured at the food bank Attorney Gieg was recommending that a separate liability policy be purchased. He contacted April Ressler of the Teeter Group to discuss the matter. Both agreed that it would be in the borough’s best interest even though the borough has only an indirect interest in the food bank that there be a liability policy taken out for it. Attorney Gieg recommended that the borough purchase the insurance while the food bank is located at133 E. Allegheny St. and as long as it is reasonably priced. Attorney Gieg is recommending that Martinsburg Borough consider adopting an ordinance regulating insurance proceeds as they relate to damaged property in the borough. This type of ordinance would ensure that if a person has insurance on their home and it is badly burned, the house would be guaranteed by the insurance company for a certain amount of money for the borough to take it down and make it safe if the property owner wouldn’t see fit to take care of it. A shortened version of the lengthy ordinance could be prepared for advertisement to keep the cost of advertising down. Attorney Gieg reported that municipalities will be required to publicize this particular upcoming earned income tax and net profits tax ordinance three times as opposed to the normal one time as required by the Borough Code. Attorney Gieg will try to meet with Morley Cohen to discuss the throughway beside theRiverside that is in much need of repair. A separate liability insurance for the food bank would be necessary since the borough does not own the property where is it operating out of now since the building has been sold. Council on a motion by Dan Smouse, seconded by Suzanne McNally, to purchase a liability policy ($1,000,000 per occurrence and $5,000 for medical) for the food bank from The Teeter Group. The motion passed unanimously. Council on a motion by Durban Metzler, seconded by Linda Smith, authorized to advertise Ordinance No. 2011-583 regulating insurance proceeds as they relate to damaged property in the borough for consideration for adoption next month. The motion passed unanimously. Attorney Gieg will contact the Teeter Group to order the policy. Suzanne McNally reported that on August 23 and 26 both borough garage roofs were painted with Columbia Sterling Alum Fiber Coating. The coating has a 6 year guarantee, which should last 12-15 years and cost $1,670.40. Suzanne McNally announced that as of the end of 2011 she will have served two full terms on council. Due to some big life changes she will not be running for re-election. Her name will not be on the ballot this fall. Durban Metzler reported that T. L. Long Excavating is expected to start three water and sewer line replacement projects in September. Linda Smith reported for the Revitalization Committee that they will be setting a meeting soon with Jessica Sheets. Correspondence was received from the Blair County Department of Solid Waste and Recycling letting us know they will keep us up to date on any changes to the municipal solid waste management plan. Each municipality must pass a new ordinance to enact the Earned Income Tax that takes effect January 1, 2012 in accordance with Act 32 and replace their existing one. In an effort to save on advertising costs, council on a motion by Suzanne McNally, seconded by Doreen Easly, voted to go in on the joint legal advertisement scheduled to be advertised three times on Sept 22, Sept 29 and Oct 6. The motion passed unanimously. Suzanne McNally met with Terry Wilt, the president of the tree committee of Hollidaysburg Borough. The trees that they decided to plant were Green Mountain Linden, Pacific Sunset Maple, and Village Green Zelkova. He also suggested a few others trees but the Green Mountain Linden was her favorite. It is conical like a pine tree. Council had a split opinion as to weather to plant the new trees random or in a line to replace the Sycamore trees that were cut down alongWoodlawn Avenue to build the new municipal building. The borough will be purchasing the trees. It would be less work to plant them in the fall rather than in the spring. They would have to be watered more in the spring. If they are to be planted this fall, council will need to decide next month whether to plant them random or in a line. The Revitalization Committee talked of planting them random and suggested letting people sponsor a tree in memory of someone as a way to pay for them. Someone also suggested planting Dogwood trees. They have small leaves and no fruit. Chief Hoover reported that the department should be able to get back $400 for each of their old radios from Motorola. Chief Hoover will obtain a cost for the new radios for inclusion in the 2012 budget. Jane Stailyprepared the annual minimum municipal obligation for the Non-Uniformed and Uniformed pension plans for insertion into the 2012 budget as a requirement of Act 205 of 1984. Council on a motion by Suzanne McNally, seconded by Doreen Easly, adopted the 2012 MMO for the Uniformed pension Plan in the amount of $14,072 and the Non-Uniformed Pension Plan in the amount of $16,713. The motion passed unanimously. Correspondence was received from the Pennsylvania Municipal Retirement System suggesting that the borough consider adopting a new pension plan agreement with PMRS for the Uniformed Pension Plan for the Killed in Service benefit. The benefit can be provided by the State through the provision of Act 51 rather than from the municipal pension plan uniformed pension plan. In the event of a tragic death of a borough police officer occurring in the line of duty, the borough’s police pension plan could incur a significant cost if it is funded from the plan instead of the State. A request was received from the Blair Senior Services to use the conference room in the new municipal building three days a week for their Meals on Wheels Program. It is currently being operated out of theMemorialChurch of the Brethren. It was the consensus of council to decline the request. They felt the program was more of a church based program and that a lot of the churches would be more than glad to have the program operated from their facility if they knew there was a need. A letter of response will be sent to Blair Senior Services. Council on a motion by Suzanne McNally, seconded by Doreen Easly, designated Thursday, October 27, from 6-8 p.m. as Trick or Treat night. The motion passed unanimously. Council on a motion by Doreen Easly, seconded by Suzanne McNally, authorized to close the Morrisons Cove Memorial Park Rennovation account at First National Bank originally opened to pass through grant received for the park which was finalized a few years ago. The motion passed unanimously. Council on a motion by Durban Metzler, seconded by Doreen Easly, adopted Resolution No. 2011-0906-01 in recognition of Dave Long for his fifteen (15) years of service as a member of the Martinsburg Municipal Authority. The motion passed unanimously. The next South Central Counties Boroughs Association meeting will be sponsored by the Borough of Martinsburg. The dinner meeting will be held at theMorrisonsCoveMemorial Park on Thursday, October 20. A tour of the new municipal building will be offered to all those wishing to see it after the meeting. Manager Stoltz reported that the State has passed a new traffic law regulating the size of all stop signs to be 30-inches in diameter by the year 2013. Most of our stop signs are 24-inches. We have about 53 stop signs and they cost about $30 each (53 x $30 = $1590). The purchase of stop signs can be paid for from the Highway Liquid Fuels Fund. They do not have to be purchased all at once. Connie Lamborn announced that there will be a documentary inWilliamsburg on Saturday, September 17. “The Blood in This Town” is a documentary about a struggling small town rallying to save thousands of lives and discovers it can revive itself. The meeting adjourned at 8:30 p.m. on a motion by Doreen Easly, seconded by Suzanne McNally. The motion passed unanimously.